Typically, an Android phone has at least two interfaces that get assigned usable ip addresses, rmnet0 for the 3G data, which for IPv4 is often carrier-grade NATed and so cannot accept incoming socket connections, and may also have an IPv6 address; and wlan0 for the wifi, which will have whatever IPv4 and/or IPv6 address it can negotiate with the network it attaches to.... and you will get IP address, sometimes you get more than one IP address.. from that any one IP address & google searched IP address would be compulsalary same. OR � Simplest way to find IP address of your device is: Open www.google.com and type �what is my ip� in search bar and Google will right away show you your device�s IP address. Typically, an Android phone has at least two interfaces that get assigned usable ip addresses, rmnet0 for the 3G data, which for IPv4 is often carrier-grade NATed and so cannot accept incoming socket connections, and may also have an IPv6 address; and wlan0 for the wifi, which will have whatever IPv4 and/or IPv6 address it can negotiate with the network it attaches to. Under Settings, Wi-Fi, , Modify Network, Advanced Options, IP Settings, you should have a choice of Static or DHCP. Choosing Static adds input boxes for IP address, Gateway, Network prefix, and DNS. If you have another phone nearby, a smartphone, download NetStumbler or a similar app, and you can find other devices that are transmitting over WiFi. 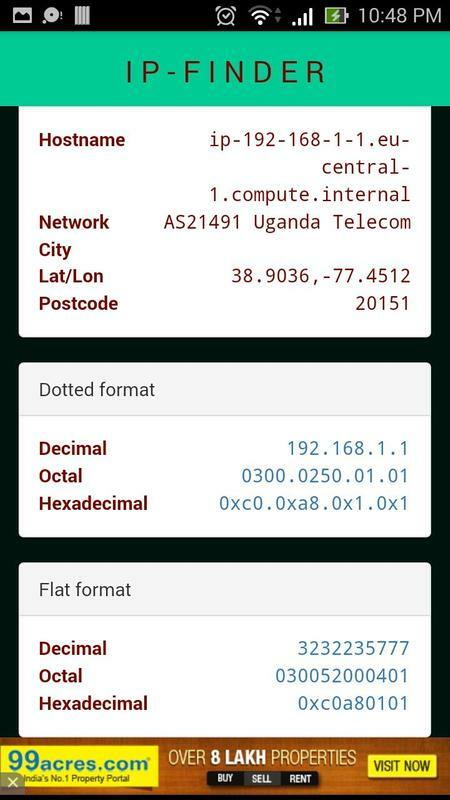 You may be able to locate the MAC address and/or IP address with that app.